Find out why our team of contributors think National Grid, IBM, and Facebook are compelling large-cap investments right now. Any business that exceeds more than $10 billion in market capitalization is called a large-cap stock. These companies tend to offer investors time-tested business models that hold up well against the gyrations of the economy, making them ideal choices for investors who favor stability. We asked a team of Fools to scour the large-cap universe and highlight a stock they think is a great buy as we head into 2017. Read on to see why they picked National Grid (NYSE:NGG), International Business Machines (NYSE:IBM), and Facebook (NASDAQ:FB). Image source: Pictures of Money on Flickr Creative Commons. Brian Feroldi (National Grid): Utilities have long been considered a safe haven for dividend investors because they are monopolies that provide a recession-proof service. However, the industry is undergoing massive changes right now because of the combination of new regulations related to carbon emissions and the increasing growth of residential solar. Thankfully, income-investors can still earn dependable profits from the sector by focusing on companies that specialize in electricity transmission and distribution instead of production. If that sounds like a winning plan to you, then I'd recommend checking out National Grid. The bulk of National Grid's profits come from its transmission and distribution business in the U.K. Regulators in the region are quite friendly, which affords National Grid the opportunity to earn high returns on its invested capital. The company then takes that dependable profit and dishes out a large portion of it to its shareholders in the form of biannual dividend check. Thankfully, shares of National Grid are currently down nearly 16% since the start of the year due to the combination of Brexit, currency fluctuations, and a general concern over rising interest rates. That's providing investors with an excellent entry price into this rock-solid dividend payer that currently yields over 5%. Tim Green (International Business Machines): After a few years of causing pain for investors, shares of IBM bounced back in 2016, gaining around 20%. The company's multiyear transformation, which has involved shedding and scaling down legacy businesses while investing heavily in areas like cloud and cognitive computing, has yet to return the company to growth. 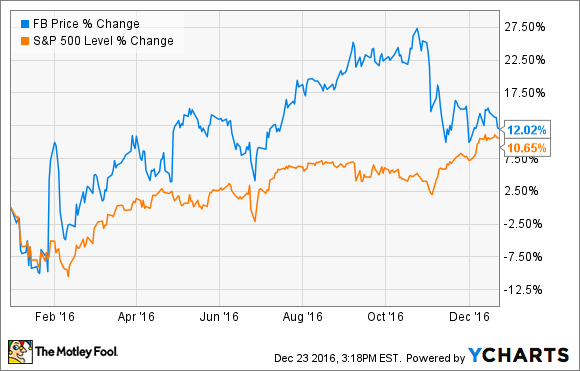 But IBM's turnaround appears to be picking up speed, which could lead to another good year for the stock in 2017. IBM has generated $12.7 billion of revenue from its cloud business over the past 12 months, with the as-a-service portion reaching an annual run rate of $7.5 billion. Software is a big part of that total, with IBM shifting its software business to a subscription model. While total software sales have been in decline in recent years, thanks in part to this shift, software sales have now increased for two consecutive quarters. With IBM stock still trading for less than 12.5 times full-year earnings guidance, a return to earnings growth could send the stock soaring. 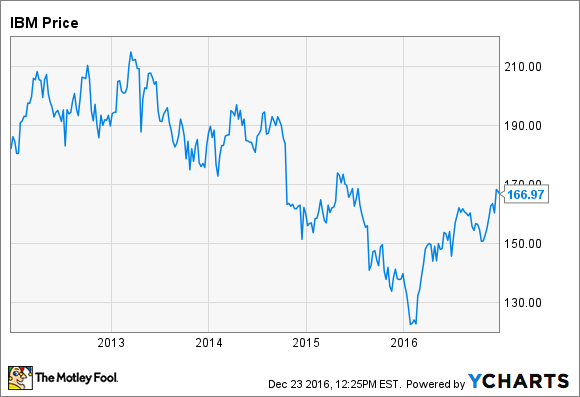 There are risks involved with investing in IBM, and a successful turnaround is not a guarantee. But there's no large-cap tech stock I'd rather own going into 2017 than Big Blue. Evan Niu, CFA (Facebook): The social network had a pretty wild 2016. Shares had been handily outperforming the broader S&P 500 for most of the year, but they proceeded to give back nearly all of that outperformance in November after the company reported third-quarter earnings and then found itself at the center of a fake news controversy. Facebook is still outperforming the broader market year to date, but just barely. More importantly, I believe the pullback since November represents a compelling buying opportunity, and that 2017 will see Facebook jump to new all-time highs. Next year will be an "aggressive investment year," according to CFO David Wehner. If that sounds eerily familiar, that's because the company said almost the exact same thing two years ago. Back then, the investor reaction was the same -- shares sold off on fears of increased spending. But if there's anything investors should have learned from last time around, it's that those investments pay off in the long run. In fact, I added to my existing Facebook position mid-November, including a leveraged play using options, precisely because I'm confident that the market was merely being shortsighted, and that shares will recover within a matter of months. It's true that revenue growth is expected to decelerate, which is partially a function of the growing revenue base that makes year-over-year comparisons harder. Beyond that, Facebook continues to execute and grow its ad business while expanding into tangential areas. Instagram is absolutely crushing it, Facebook continues to push into live streaming, and virtual reality inches closer to the mainstream. I think a year from now, Facebook shares will be meaningfully higher, so January is as good a time as any to buy in.